Combining a Handfasting and a Civil (registrar) Service. Q: Is handfasting wedding legal? This is a question I hear often. Answer: it is not the form of wedding that makes it legal, but he or she who signs the marriage register. Confused? Scottish marriage law is a little complex, so let me explain so that you understand how to get what you want for your big day. Only a civil registrar (council employee) or a minister from a recognised religion/ body has authority to sign the marriage schedule/ licence, on behalf of the General Registrar Scotland. The licence is the State's document to record your marriage for legal purposes (such as inheritance). I am neither minister nor council registrar, which gives me, and you, more freedom in the form of ceremony. 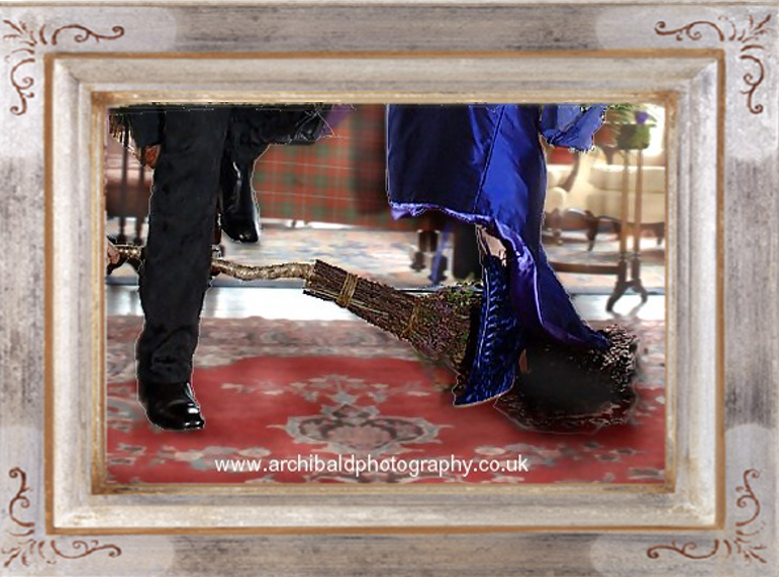 So the question is: how does one have a handfasting in the Scottish tradition, where your own sense of spirit, emotion and connection are expressed AND have the state recognise your union? Answer: Simple. You need two separate parts to your wedding: the handfasting ceremony with me joins you together in spirit and emotion, amidst your family; the Civil service with a registrar allows the state recognise your new legal status. I want to create a ceremony that is the most enjoyable and appropriate for you and your guests. I will create a ceremony that engages the guests, touches their hearts and is meaningful to you, the couple. Sometimes, clients can inadvertently make that harder to achieve, hence the need for the next section of this page. Due to strict guidelines for Registrars in Scotland (and probably the same in England and Wales), the two parts to your ceremony (civil and spiritual) cannot be combined. They must be separate. That is the registrar cannot be present at a spiritual or religious ceremony. This is the norm in mainland-European marriage practice. I also have requirements for this combining so that both parts of the ceremony happen in a good way. There are two ways that I recommend that you separate the civil and spiritual. I don't mind which you choose as long as I am fully informed of your choice. 1. Do the civil bit on a different day, week or month to your wedding. Go to the registrar's office during office hours (which is cheaper) perhaps in your home town (again, less costly). Some of our couples call this a “Jeans and T-shirt Service” as that is how they turn up to the registry office, with only two witnesses and have their marriage recorded with the state. 2. If you intend to have your marriage legally registered by the state on the same day as your Handfasting Wedding Ceremony and at the same venue, then I suggest that you have the registrar attend you and your two witnesses (no other guests present) either in the morning while you are getting ready before the Handfasting, or at a convenient time during the reception while your guests are entertained elsewhere. Again, do not have guests present other than your two witnesses. Why do I suggest that you have no guests at your civil part? "You can't hang a person twice for the same crime" and you can't have two ceremonies in one wedding (handfasting and civil). Two ceremonies is simply redundant – an unnecessary repetition in expressing ideas. More importantly, it confuses the guests and sometimes the couple. Guests go from one gathering to the next, congratulating you twice, etc. Make one event clearly a ceremony and the other clearly a legal transaction. The legal service will take about 5 minutes. Do not include poetry or readings or make a “ceremony” of the civil service, as that dilutes the “ceremony” aspect of the Handfasting. Many couples have said that they do legal aspects without even telling their family or friends. Some couples like to be seen to "sign the register" after the ceremony. If you wish, I can provide my own hand-fasting certificate for you to sign, witness and keep. This is NOT the registrar's document for legal recognition. Why I don't do the legal bit too? At this point you might be wondering why I don't conduct the legal aspect of a wedding. It's very simple. In order to do that, I would need to join a “church” or “body”, or become a council employee, none of which would permit me to offer you a ceremony of your choosing. That's why couples come to me: for the uniqueness, the Scottish traditions, the spiritual expression of their own. If you wish to combine your Civil Service and your Handfasting Wedding Ceremony differently to my recommendation, then we will need to discuss your reasoning before I agree to perform the ceremony, to see if I can accommodate you. 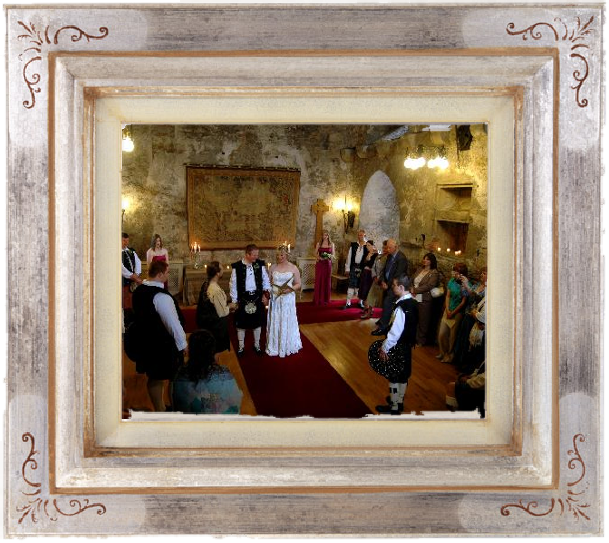 Questions and comments are welcome before you decide whether Handfasting in the Scottish Tradition is for you. Which leads us on to marriages with one or more foreign nationals. Britian is unfortunately becoming increasingly difficult to get married in if you are not a British Citizen. There are ways though, involving a civil marriage, sometimes abroad, followed by the spiritual marriage, with family and friends, officiated by someone like myself, in a beautiful Scottish Castle, perhaps. It works rather well and is quite common. So if you're going through marriage visa stress, then you're not alone! I can help. I hope to have the honour of performing your ceremony and bringing pleasure to your wedding.